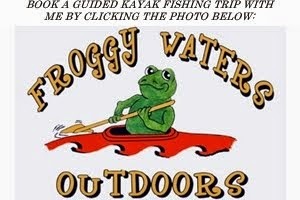 Wednesday I got a call from a good friend, Gary Ribet (aka froggy...aka froggy waters). 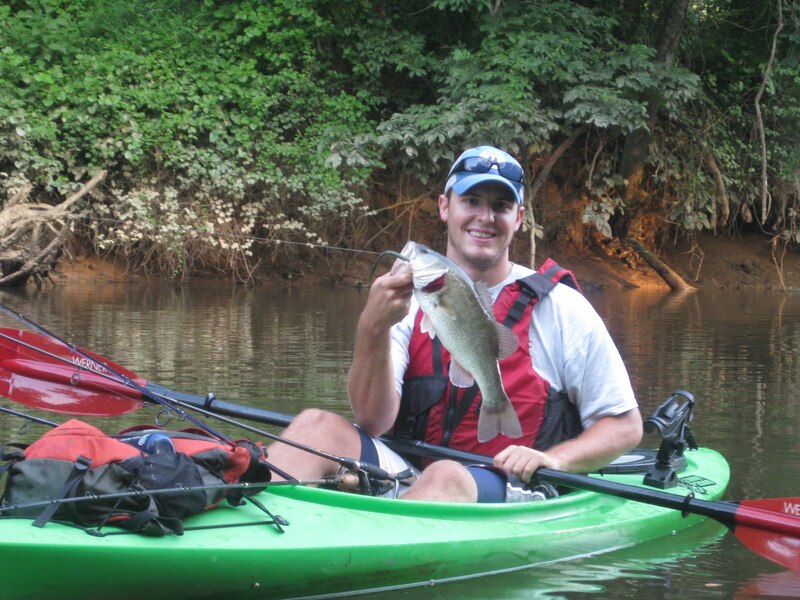 He asked if I wanted to hit a local river the next morning - so how could I refuse. It was an area I had never fished before, but of which he spoke highly. I made my way down the dusty, dirt road and met him at 6 AM. After shooting the bull for a while we launched and began down river. 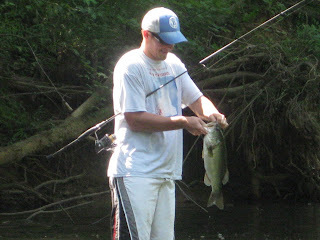 After fishing a few lay downs I threw my buzzbait along a fallen log and had our first fish of the day - a 1 lb bass. A few minutes later Gary hooked up with a chunky bass on a scrounger head with a Deep Creek lures trailer, but the fish threw the hook at the boat. 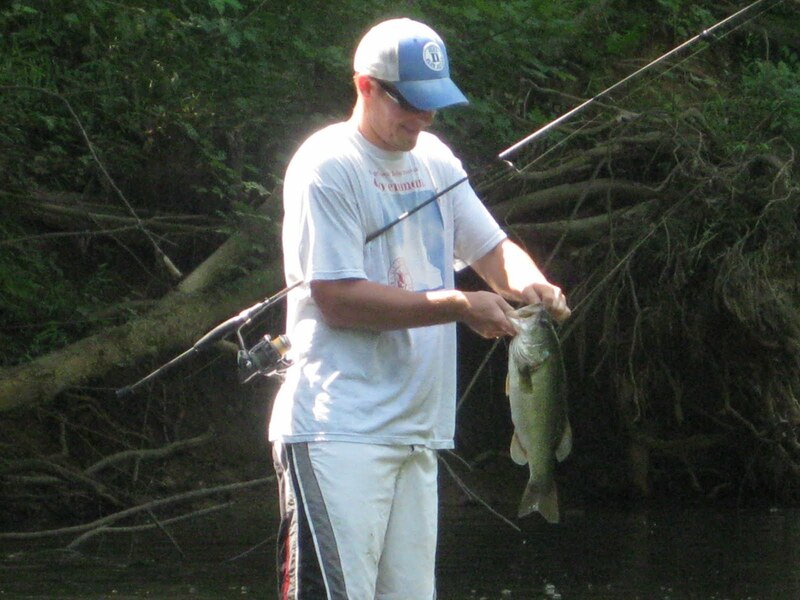 A short time after I flipped my Deep Creek Lures Sink n' Catch worm to a downed tree and landed a 2.5 lb bass. Already, we knew it would be a good day. We turned around and started making our way up-river. Gary quickly landed a solid 2+ lb bass on a 5" worm. Our excitement was running high as I got a hard bite, but lost what felt like a solid fish. A few casts later I hooked into what would be my biggest fish of the day on the DCL S&C worm. It was a fat 19.5", 4.4 lb bass. Shortly after, I heard Gary let out a holler and turned to see a nice bass leave the water. 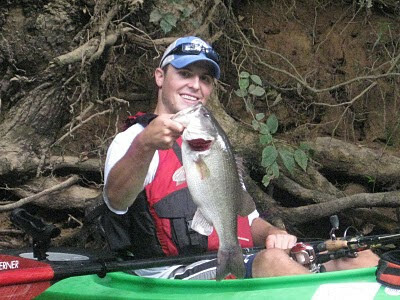 After a fight which included some teamwork, moving sticks, and some gentle persuading he landed a 20+", 4.0 lb bass. Over the next mile of river we fished hard through laydowns and rock ledges with plastic worms and swimbaits. We landed fish fairly consistenly ranging from 1.5 to 3.5 lbs. We reached our turn around point with 12 fish. In one of the first pools after we turned around I tossed my DCL worm along a laydown and it was 'fish on'. A chunky 3.3 lb bass gave my spinning combo all it could handle before I could land him. Thankfully, I was out of my yak at the time, which helped me untangle the fish from a pile of branches which he quickly found his way into. We fished back down river in the sun and heat. Fish were holding closer to the deeper river channel, but we were still catching fish regularly. As we approached the launch we had landed around 20 fish between us and I was hoping for one more good fish before the day ended. I cast my worm along a downed log and felt the stereotypical "thump" of a good bite. The fish headed for the channel initially and then quickly bent back around toward the bottom of the log. It broke the surface of the water multiple times and put up an awesome fight, as most river fish do. I landed the 3 lb bass with a smile on my face. It would be my last fish of the day. We paddled slightly farther and Gary managed two more decent bass. As we pulled up to the grassy launch I was exhausted from the heat and was wishing I had brought some lunch. But the feeling of a good day on the water always trumps the other stuff. We were content with our day, full of chunky, quality fish, good conversation, and of course a couple "mystery fish" that got away and will keep us coming back. I always enjoy my time on the water with Gary and I look forward to fishing with him again soon. Weightless plastic worms and swimbaits were the ticket today - typical of mid-summer trips on the areas small rivers. 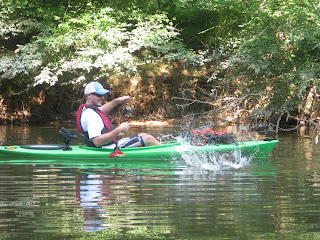 We also threw t-rigged plastics, jigs, and a variety of other plastics with no luck. Until next time....tight lines! Impressive fish Drew...beautiful pictures too. Nice you actually took your camera on the boat as well!! Well done! Enjoying this blog...love the pics! Keep it up fishing yakers! Looks great Drew. Keep up the good work! Drew, nice post! Good to see a PA boy cath'n some fish down south. I'll add your blog to my blog role...keep on posting...great stuff!! Wow! Froggy takes some great pictures. Good stuff guys! Keep it up.